You may not know it, or you may not immediately assign meaning to those three letters placed side by side, but there’s almost no doubt that you have at least a passing familiarity with CBT. If you’ve ever interacted with a therapist, a counselor, or a clinician in a professional setting, you have likely participated in Cognitive Behavioral Therapy. If you’ve ever heard friends or loved ones talk about how a mental health professional helped them recognize their fears or sources of distress and aided them in altering their behavior to more effectively work towards their goals, you’ve heard about the impacts of CBT. Cognitive Behavioral Therapy is one of the most used tools in the psychologist’s toolbox. It’s based on a fairly simple idea which, when put into practice, can have wildly positive outcomes. Before you start reading this article, I recommend you to download these 3 Positive CBT exercises for free. 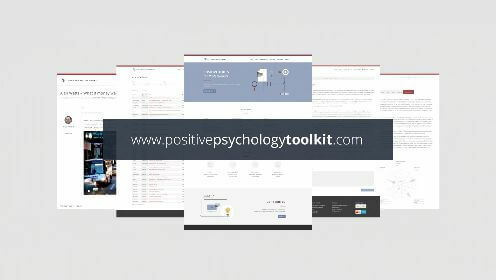 With these exercises, you will not just be able to understand positive CBT on a theoretical level, but you’ll also have the tools to apply it in your work with clients or students. This simple idea is that our unique patterns of thinking, feeling, and behaving are significant factors in our experiences, both good and bad. Since these patterns have such a significant impact on our experiences, it follows that altering these patterns can change our experiences (Martin, 2016). Cognitive Behavioral Therapy aims to change our thought patterns, the beliefs we may or may not know we hold, our attitudes, and ultimately our behavior in order to help us face our difficulties and more effectively strive towards our goals. The founder of Cognitive Behavioral Therapy is a psychiatrist named Aaron Beck, a man who practiced psychoanalysis until he noticed the prevalence of internal dialogues in his clients, and realized how strong the link between thoughts and feelings can be. He altered the therapy he practiced in order to help his clients identify, understand, and deal with the automatic, emotion-filled thoughts that arise throughout the day. Beck found that a combination of cognitive therapy and behavioral techniques produced the best results for his clients. In describing and honing this new therapy, Beck laid the foundations of the most popular and influential form of therapy of the last 50 years. This form of therapy is not designed for lifelong participation but focuses more on helping clients meet their goals in the near future. Most CBT treatment regimens last from five to ten months, with one 50 to 60-minute session per week. Cognitive Behavioral Therapy is a hands-on approach that requires both the therapist and the client to be invested in the process and willing to actively participate. The therapist and client work together as a team to identify the problems the client is facing, come up with new strategies for addressing them, and thinking up positive solutions (Martin, 2016). Many of the most popular and effective Cognitive Behavioral Therapy techniques are applied to what psychologists call “cognitive distortions” (Grohol, 2016). Cognitive distortions: inaccurate thoughts that reinforce negative thought patterns or emotions. Cognitive distortions are faulty ways of thinking that convince us of a reality that is simply not true. Filtering refers to the way many of us can somehow ignore all of the positive and good things in our day to focus solely on the negative. It can be far too easy to dwell on a single negative aspect, even when surrounded by an abundance of good things. 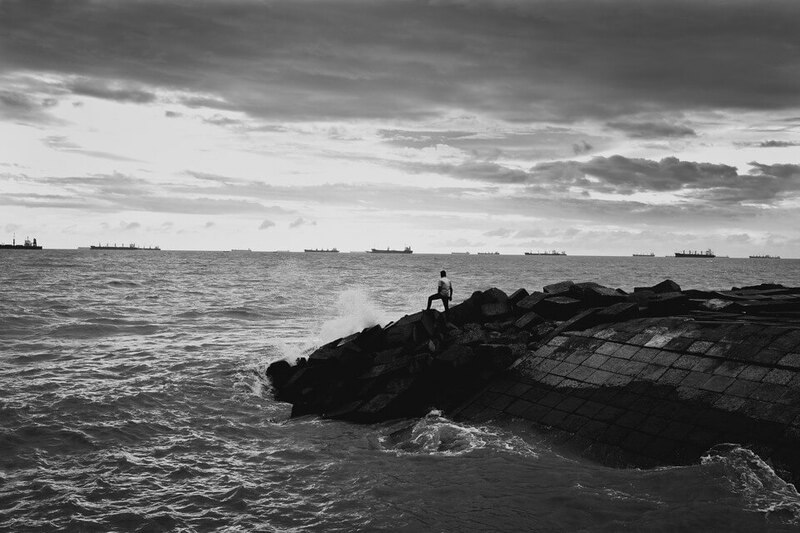 This cognitive distortion is all about seeing black and white only, with no shades of grey. This is all-or-nothing thinking, with no room for complexity or nuance. If you don’t perform perfectly in some area, then you may see yourself as a total failure instead of simply unskilled in one area. Overgeneralization is taking a single incident or point in time and using it as the sole piece of evidence for a broad general conclusion. For example, a person may be on the lookout for a job but have a bad interview experience, but instead of brushing it off as one bad interview and trying again, they conclude that they are terrible at interviewing and will never get a job offer. Similar to overgeneralization, this distortion involves faulty reasoning in how we make conclusions. Instead of overgeneralizing one incident, however, jumping to conclusions refers to the tendency to be sure of something without any evidence at all. We may be convinced that someone dislikes us with only the flimsiest of proof, or we may be convinced that our fears will come true before we have a chance to find out. This distortion involves expectations that the worst will happen or has happened, based on a slight incident that is nowhere near the tragedy that it is made out to be. For example, you may make a small mistake at work and be convinced that it will ruin the project you are working on, your boss will be furious, and you will lose your job. Alternatively, we may minimize the importance of positive things, such as an accomplishment at work or a desirable personal characteristic. This is a distortion where an individual believes that everything they do has an impact on external events or other people, no matter how irrational the link between. The person suffering from this distortion will feel that they have an unreasonably important role in the bad things that happen around them. For instance, a person may believe that the meeting they were a few minutes late in getting to was derailed because of them and that everything would have been fine if they were on time. Another distortion involves feeling that everything that happens to you is a result of external forces or due to your own actions. Sometimes what happens to us is due to forces we can’t control, and sometimes what happens is due to our actions, but the false thinking is in assuming that it is always one or the other. We may assume that the quality of our work is due to working with difficult people, or alternatively that every mistake someone else makes is due to something we did. We are often concerned about fairness, but this concern can be taken to extremes. As we know, life is not always fair. The person who goes through life looking for fairness in all their experiences will end up resentful and unhappy. Sometimes things will go our way, and sometimes they will not, regardless of how fair it may seem. When things don’t go our way, there are many ways we can explain or assign responsibility for the outcome. One method of assigning responsibility is blaming others for what goes wrong. Sometimes we may blame others for making us feel or act a certain way, but this is a cognitive distortion because we are the only ones responsible for the way we feel or act. “Shoulds” refer to the implicit or explicit rules we have about how we and others should behave. When others break our rules, we are upset. When we break our own rules, we feel guilty. For example, we may have an unofficial rule that customer service representatives should always be accommodating to the customer. When we interact with a customer service representative that is not immediately accommodating, we might get angry. If we have an implicit rule that we are irresponsible if we spend money on unnecessary things, we may feel exceedingly guilty when we spend even a small amount of money on something we don’t need. Clearly, our emotions are not always indicative of the objective truth, but it can be difficult to look past how we feel. The fallacy of change lies in expecting other people to change as it suits us. This ties into the feeling that our happiness depends on other people, and their unwillingness or inability to change, even if we push and press and demand it, keeps us from being happy. This is clearly a damaging way to think since no one is responsible for our happiness except for us. This cognitive distortion is an extreme form of generalizing, in which we generalize one or two instances or qualities into a global judgment. For example, if we fail at a specific task, we may conclude that we are a total failure in not only this area but all areas. Alternatively, when a stranger says something a bit rude, we may conclude that he or she is an unfriendly person in general. 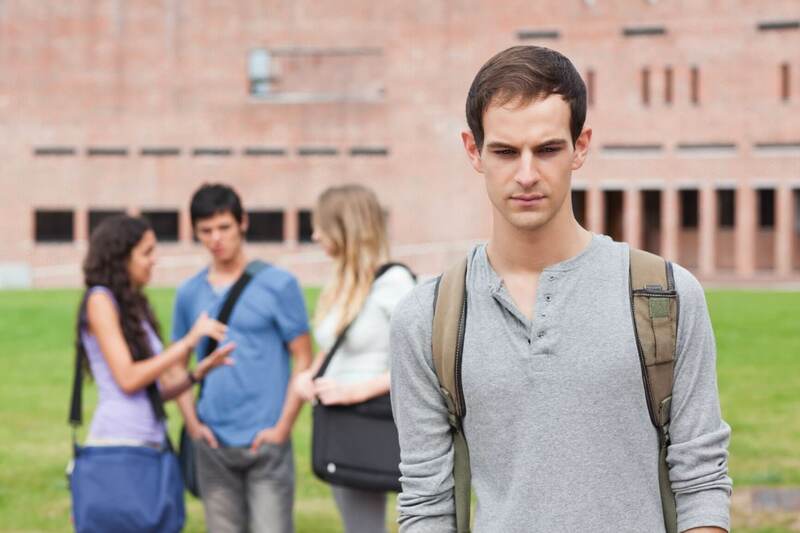 Mislabeling is specific to using exaggerated and emotionally loaded language, such as saying a woman has abandoned her children when she leaves her children with a babysitter to enjoy a night out. While we all enjoy being right, this distortion makes us think we must be right, that being wrong is unacceptable. We may believe that being right is more important than the feelings of others, being able to admit when we’ve made a mistake or being fair and objective. This distortion involves expecting that any sacrifice or self-denial on our part will pay off. We may consider this karma, and expect that karma will always immediately reward us for our good deeds. Of course, this results in feelings of bitterness when we do not receive our reward (Grohol, 2016). 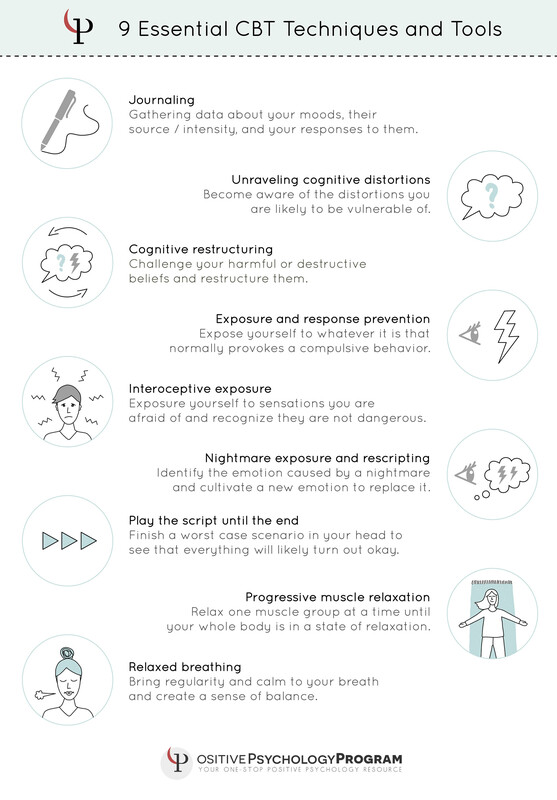 Many tools and techniques found in Cognitive Behavioral Therapy are intended to address or reverse these cognitive distortions. There are many tools and techniques used in Cognitive Behavioral Therapy, many of which have spread from the therapy context to everyday life. The nine techniques and tools listed below are some of the most common and effective CBT practices. This technique is a way of “gathering data” about our moods and our thoughts. This journal can include the time of the mood or thought, the source of it, the extent or intensity, and how we responded to it, among other factors. This technique can help us to identify our thought patterns and emotional tendencies, describe them and find out how to change, adapt, or cope with them. This is a main goal of CBT and can be practiced with or without the help of a therapist. In order to unravel the cognitive distortions you hold, you must first become aware of which distortions you are most vulnerable to. Part of this involves identifying and challenging our harmful automatic thoughts, which frequently fall into one of the categories listed earlier. Once you identify the distortions or inaccurate views on the world you hold, you can begin to learn about how this distortion took root and why you came to believe it. When you discover a belief that is destructive or harmful, you can begin to challenge it. For example, if you believe that you must have a high paying job to be a respectable person, but you lose your high paying job, you will begin to feel bad about yourself. Instead of accepting this faulty belief that leads you to think unreasonably negative thoughts about yourself, you could take this opportunity to think about what makes a person “respectable,” a belief you may not have explicitly considered before. This technique is specifically effective for those who suffer from obsessive compulsive disorder (OCD). You can practice this technique by exposing yourself to whatever it is that normally elicits a compulsive behavior, but doing your best to refrain from the behavior and writing about it. You can combine journaling with this technique, or use journaling to understand how this technique makes you feel. This technique is intended to treat panic and anxiety. It involves exposure to feared bodily sensations in order to elicit the response, activates any unhelpful beliefs associated with the sensations, maintains the sensations without distraction or avoidance, and allow new learning about the sensations to take place. It is intended to help the sufferer see that symptoms of panic are not dangerous, although they may be uncomfortable. Nightmare exposure and rescripting are intended specifically for those suffering from nightmares. This technique is similar to interoceptive exposure, in that the nightmare is elicited, which brings up the relevant emotion. Once the emotion has arisen, the client and therapist work together to identify the desired emotion and develop a new image to accompany the desired emotion. This technique is especially useful for those suffering from fear and anxiety. In this technique, the individual who is vulnerable to crippling fear or anxiety conducts a sort of thought experiment, where they imagine the outcome of the worst case scenario. Letting this scenario play out can help the individual to recognize that even if everything they fear comes to pass, it will likely turn out okay. This is a familiar technique to those who practice mindfulness. Similar to the body scan, this technique instructs you to relax one muscle group at a time until your whole body is in a state of relaxation. You can use audio guidance, a YouTube video, or simply your own mind to practice this technique, and it can be especially helpful for calming nerves and soothing a busy and unfocused mind. This is another technique that is not specific to CBT but will be familiar to practitioners of mindfulness. 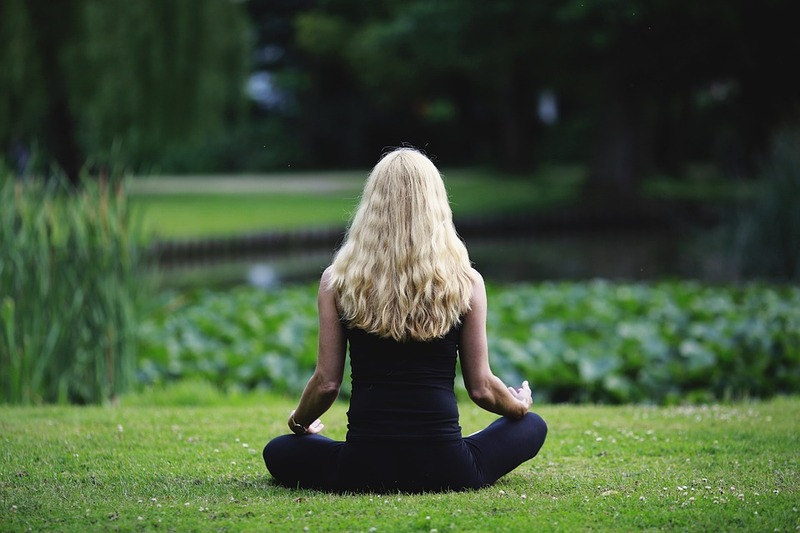 There are many ways to relax and bring regularity to your breath, including guided and unguided imagery, audio recordings, YouTube videos, and scripts. 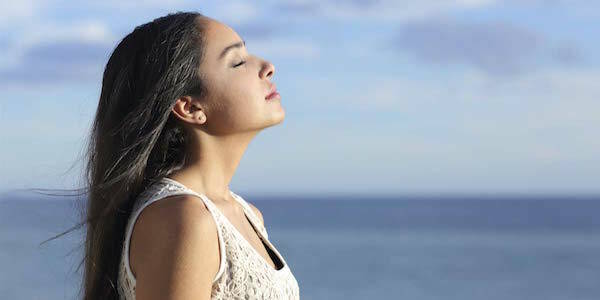 Bringing regularity and calm to your breath will allow you to approach your problems from a place of balance, facilitating more effective and rational decision making (Megan, 2016). These techniques can help those suffering from a range of mental illnesses and afflictions, including anxiety, depression, OCD, and panic disorder, and they can be practiced with or without the guidance of a therapist. To try some of these techniques without the help of a therapist, see the next section for worksheets and handouts to assist with your practice. If you’re a therapist looking for ways to guide your client through treatment or a hands-on person who loves to learn by doing, there are many Cognitive Behavioral Therapy worksheets that can help. This worksheet instructs the user to first list any problems or difficulties you are having. Next, you list your vulnerabilities (i.e., why you are more likely to experience these problems than someone else) and triggers (i.e., the stimulus or source of these problems). Once you have defined the problems and understand why you are struggling with them, you go on to list coping strategies. These are not solutions to problems, but ways in which you can deal with the effects of these problems that can have a temporary impact. Next, you list the effects of these coping strategies, such as how they make you feel in the short-term and long-term, and the advantages and disadvantages of each strategy. Finally, you move on to listing alternative actions. If your coping strategies are not totally effective against the problems and difficulties that are happening, you are instructed to list other strategies that may work better. This worksheet gets you (or your client) thinking about what you are doing now and whether it is the best way forward. One popular technique in Cognitive Behavioral Therapy is functional analysis. This technique helps you (or the client) learn about yourself, specifically what leads to specific behaviors and what consequences result from those behaviors. In the middle of the worksheet is a box labeled “Behaviors.” In this box, you write down any potentially problematic behaviors or other behaviors you wish to analyze. On the left side of the worksheet is a box labeled “Antecedents,” in which you or the client write down the factors that preceded a particular behavior. These are factors that led up to the behavior under consideration, either directly or indirectly. On the right side is the final box, labeled “Consequences.” This is where you write down the consequences of the behavior, or what happened as a result of the behavior under consideration. “Consequences” may sound inherently negative, but they are not necessarily negative; some positive consequences can arise from many types of behaviors, even if more negative consequences result as well. This worksheet can help you or your client to find out whether particular behaviors are adaptive and helpful in striving towards your goals, or destructive and self-defeating. This worksheet helps you address what some Cognitive Behavioral Therapy therapists call the “5 P Factors” – presenting, predisposing, precipitating, perpetuating, and positives. This formulation process can help you connect the dots between your core beliefs and thought patterns and your present behavior. This worksheet presents five boxes at the top of the page, which should be completed before moving on to the rest of the worksheet. The first box is labeled “Precipitating Events / Triggers,” and corresponds with the Precipitating factor. In this box, you are instructed to write down the events or stimuli that provoke a certain behavior. The next box is labeled “Early Experiences” and corresponds to the Predisposing factor. This is where you list the experiences that you had early on, all the way back to childhood, that may have contributed to the behavior. The final box is labeled “Presenting Problems / Effects of Old Rules.” This is where you write down how well these rules are working for you. Are they helping you to be the best you can be? Are they helping you to effectively strive towards your goals? Below this box, there are two flow charts that you can fill out based on how these behaviors and feelings are perpetuated. You are instructed to think of a situation that produces a negative automatic thought and record the emotion and the behavior that this thought provokes, as well as the bodily sensations that can result. Filling out these flow charts can help you see what drives your behavior or thought and what results from it. Below these two charts is the box “Protective Factors.” This is where you list the factors that can help you deal with the problematic behavior or thought, and perhaps help you break the perpetuating cycle. This can be things that help you cope once the thought or behavior arises or things that can disrupt the pattern once it is in motion. Finally, the last box is “New Rules for Living.” This box relates to the Positive factor, in that it provides you with an opportunity to create new rules for yourself that will disrupt the destructive cycle and allow you to become more effective in meeting your therapeutic goals. This worksheet will be available for download soon. This worksheet is especially helpful for people who are struggling with negative thoughts and need to figure out when and why they are most likely to pop up. By learning more about what provokes certain automatic thoughts, they become easier to address and reverse. On the far left, there is space to write down the date and time a dysfunctional thought arose. The second column is where the situation is listed. The user is instructed to describe the event that led up to the dysfunctional thought in detail. The third column is for the automatic thought. This is where the dysfunctional automatic thought is recorded, along with a rating of belief in the thought on a scale from 0% to 100%. The next column is where the emotion or emotions elicited by this thought are listed, also with a rating of intensity on a scale from 0% to 100%. The fifth column is labeled “Distortion.” This column is where the user will identify which cognitive distortion(s) they are suffering from with regards to this specific dysfunctional thought, such as all-or-nothing thinking, filtering, jumping to conclusions, etc. The second to last column is for the user to write down alternative thoughts, more positive and functional thoughts that can replace the negative one. Finally, the last column is for the user to write down the outcome of this exercise. Were you able to confront the dysfunctional thought? Did you write down a convincing alternative thought? Did your belief in the thought and/or the intensity of your emotion(s) decrease? One of my favorite Cognitive Behavioral Therapy worksheets is the “Fact or Opinion” worksheet because it can be extremely helpful in recognizing that your thoughts are not necessarily true. Of course, it can be hard to accept this, especially when we are in the throes of a dysfunctional thought or intense emotion. Filling out this worksheet can help you come to this realization. I didn’t lend my friend money when they asked. This simple exercise can help the user to see that while we have lots of emotionally charged thoughts, they are not all objective truths. Recognizing the difference between fact and opinion can assist us in challenging the dysfunctional or harmful opinions we have about ourselves and others. This worksheet employs the use of Socratic questioning, a technique that can help the user to challenge irrational or illogical thoughts. The top of the worksheet describes how thoughts are a running dialogue in our minds, and they can come and go so fast that we hardly have time to address them. This worksheet aims to help us capture one or two of these thoughts and analyze them. The first box to be filled out is “Thoughts to be questioned.” This is where you write down a specific thought, usually, one you suspect is destructive or irrational. Next, you write down the evidence for and against this thought. What evidence is there that this thought is accurate? What evidence exists that calls it into question? Once you have identified the evidence, you can make a judgment on this thought, specifically whether it is based on facts or your feelings. Next, you answer a question on whether this thought is truly a black and white situation, or whether reality leaves room for shades of grey. This is where you think about whether you are using all-or-nothing thinking, or making things unreasonably simple when they are truly complex. In the last box on this page, you consider whether you could be misinterpreting the evidence or making any unverified assumptions. On the next page, you are instructed to think about whether other people might have different interpretations of the same situation, and what those interpretations might be. Next, ask yourself whether you are looking at all the relevant evidence or just the evidence that backs up the belief you already hold. Try to be as objective as possible. The next box asks you whether your thought may an exaggeration of a truth. Some negative thoughts are based in truth but extended past their logical boundaries. Next, you are instructed to consider whether you are entertaining this negative thought out of habit or because the facts truly support it. Once you have decided whether the facts support this thought, you are encouraged to think about how this thought came to you. Was it passed on from someone else? If so, are they a reliable source for truth? Finally, you complete the worksheet by identifying how likely the scenario your thought brings up actually is, and whether it is the worst case scenario. These “Socratic questions” encourage a deep dive into the thoughts that may plague you, and offer an opportunity to analyze and evaluate them for truth. If you are having thoughts that do not come from a place of truth, this worksheet can be an excellent tool for identifying and defusing them. Haven’t had enough CBT tools and techniques yet? Continue on for more useful and effective exercises! These are related to thought experiments, in that you engage in a “what if” consideration. Behavioral experiments differ from thought experiments in that you actually test out these “what ifs” outside of your thoughts (Boyes, 2012). First, you would try criticizing yourself when you need the motivation to work harder and record the results. Then you would try being kind to yourself and recording the results. Next, you would compare the results to see which thought was closer to the truth. These behavioral experiments can help you learn how to best strive towards your therapeutic goals and how to be your best self. Thought records are useful in testing the validity of your thoughts (Boyes, 2012). They involve gathering and evaluating the evidence for and against a particular thought, allowing for an evidence-based conclusion on whether the thought is valid or not. Thought records apply the use of logic to ward off unreasonable negative thoughts and replace them with more balanced, rational thoughts (Boyes, 2012). This technique can be especially helpful for dealing with depression (Boyes, 2012). It involves scheduling activities in the near future that you can look forward to. For example, you may write down one activity per day that you will engage in over the next week. This can be as simple as watching a movie you are excited to see or calling a friend to chat. It can be anything that is pleasant for you, as long as it is not unhealthy (i.e., eating a whole cake in one sitting or smoking). You can also try scheduling an activity for each day that provides you with a sense of mastery or accomplishment (Boyes, 2012). It’s great to do something pleasant, but doing something small that can make you feel accomplished may have longer lasting and farther reaching effects. This simple technique can introduce more positivity into your day and help you make your thinking less negative. This exercise involves thinking about a recent memory that produced strong negative emotions and analyzing the situation. For example, if you recently had a fight with your significant other and they said something hurtful, you can bring that situation to mind and try to remember it in detail. Next, you would try to label the emotions and thoughts you experienced during the situation and identify the urges you felt (e.g., to run away, to yell at your significant other, to cry). Visualizing this negative situation, especially for a prolonged period of time, can help you to take away its ability to trigger you and reduce avoidance coping (Boyes, 2012). When you expose yourself to all of the feelings and urges you felt in the situation and survive experiencing the memory, it takes some of its power away. This technique may sound complicated, but it’s relatively simple. Situation Exposure Hierarchies involves making a list of things that you would normally avoid (Boyes, 2012). For example, someone with severe social anxiety may typically avoid making a phone call instead of emailing or asking someone on a date. Next, you rate each item on how distressed you think you would be, on a scale from 0 to 10, if you engaged in it. For the person suffering from severe social anxiety, asking someone on a date may be rated a 10 on the scale, while making a phone call instead of emailing might be rated closer to a 3 or 4. Once you have rated each item, you rank them according to their distress rating. This will help you recognize the biggest difficulties you face, which can help you decide which items to address and in what order. It may be best to start with the less distressing items and work your way up to the most distressing items. If you’re interested in giving CBT a try with your clients, there are many books and manuals that can help get you started. Some of these books are for the therapist only, and some are to be navigated as a team or with guidance from the therapist. There are many other manuals and workbooks out there that can help get you started with Cognitive Behavioral Therapy, but these are a good start. Before we go, there are a few more Cognitive Behavioral Therapy activities and exercises that may be helpful for you or your clients that we’d like to cover. As readers of this blog will likely know by now, mindfulness can have a wide range of positive impacts, including helping with depression, anxiety, addiction, and many other mental illnesses or difficulties. Mindfulness can help those suffering from harmful automatic thoughts to disengage from rumination and obsession over these thoughts by helping them stay firmly grounded in the present. This is a somewhat fancy name for a simple idea that you have likely already heard of: breaking up large tasks into small steps to make it easier to accomplish. It can be overwhelming to be faced with a huge goal we would like to accomplish, like opening a business or remodeling a house. 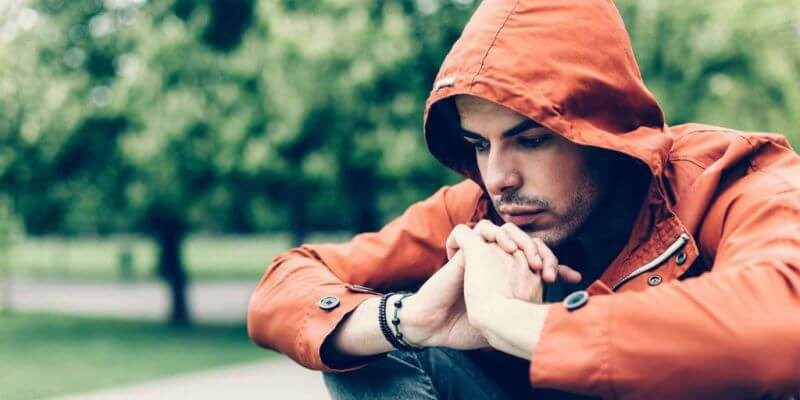 This is true in mental health treatment as well, since the goal to overcome depression or anxiety and achieve mental wellness can seem like a monumental task to those who are suffering from severe symptoms. By breaking the large goal into small, easy to accomplish steps, we can map out the path to success and make the journey seem a little less overwhelming. This technique can be difficult for someone just beginning their Cognitive Behavioral Therapy treatment or suffering from severe symptoms, but it can also be extremely effective (Anderson, 2014). When you (or your client) are being plagued by negative thoughts, it can be hard to confront them, especially if your belief in these thoughts is strong. 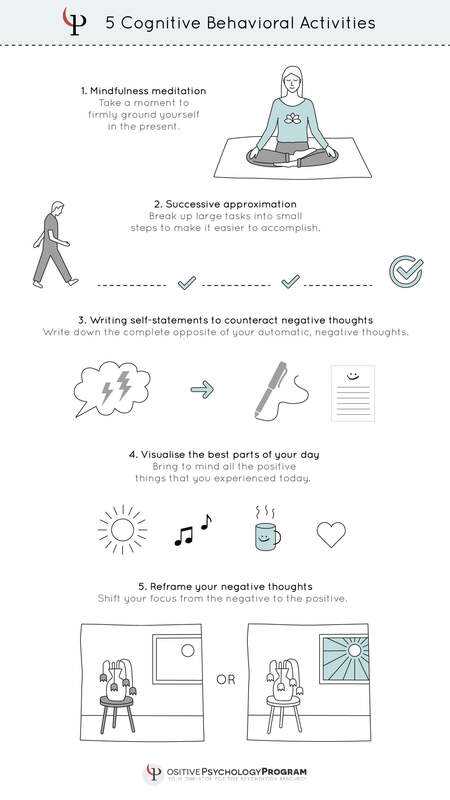 To counteract these negative thoughts, it can be helpful to write down a positive, opposite thought. For example, if the thought that you are worthless keeps popping into your head, try writing down a statement like “I am a person with worth” or “I am a person with potential.” In the beginning, it can be difficult to accept these replacement thoughts, but the more you bring out these positive thoughts to counteract the negative ones, the stronger the association will be. When you are feeling depressed or negative, it is difficult to recognize that there is good in your life as well. This simple technique of bringing to mind the good parts of your day can be a small step in the direction of recognizing the positive (Anderson, 2014). All you need to do is write down the things in your life that you are most thankful for or the things that are most positive in your day. 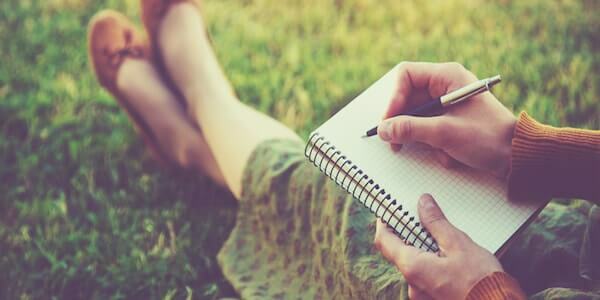 The simple act of writing down these good things can forge new associations in your mind which make it easier to see the positive, even when there is plenty of negative as well. It can be all too easy to succumb to negative thoughts as a default setting. If you find yourself immediately thinking a negative thought when you see something new, such as entering an unfamiliar room and thinking “I hate the color of that wall,” give reframing a try (Anderson, 2014). Reframing involves countering the negative thought(s) by noticing things you feel positive about as quickly as possible. For instance, in the example where you immediately think of how much you hate the color of that wall, you would push yourself to notice five things in the room that you feel positively about (e.g., the carpet looks comfortable, the lampshade is pretty, the windows let in a lot of sunshine). You can set your phone to remind you throughout the day to stop what you are doing and think of the positive things around you. This can help you to push your thoughts back into the realm of the positive instead of the negative. As always, I hope this post has been helpful. There are a lot of great tips and techniques in here that can be extremely effective in the battle against depression, anxiety, OCD, and a host of other problems or difficulties. However, as is the case with many treatments, they depend on you (or your client) putting in a lot of effort. I would encourage you to give these techniques a real try, and allow yourself the luxury of thinking they may actually work. When we approach a potential solution with the assumption that it will not work, then it will probably not work. When we approach a potential solution with an open mind and the thought that it just might work, it has a much better chance of succeeding. So if you are struggling with negative automatic thoughts, please consider these tips and techniques and give them a real shot. Likewise, if your client is struggling, encourage them to make the effort, because the payoff can be better than they can imagine. For a list of other suicide prevention websites, phone numbers, and resources, see this website. Please know that there are people out there who care and that there are treatments that can help. Thank you for reading, and please let us know about your experiences with Cognitive Behavioral Therapy in the comments section. Have you tried it? How did it work for you? Are there any other helpful exercises or techniques that we did not touch on in this piece? Which Works Better, Positive Psychotherapy or CBT? Thank you for all the effort and time that you took to write this article. It is well written and very informative and I think it’s helpful too. Thank you for the great content. This is such an informative article, and I want to thank you for your hard work and for all the resources that you provide! This is great information. We all have dysfunctional views in life it is great to be able to figure them out and then work on them. Thank you for sharing! So kind of you to share this. It’s a fantastic resource and so glad to see so many people enjoying and using it. C.B.T since the failure of many lives was based on my trans humane loss of gravity with the forsaken religious intolerance of the Museum of Natural History collapsed by Civilizations’ Discontent, the discontinue cognito by all sources of plagerism has showed to be most futile. As the courses of humanities are not in my jurist failure, my brains’ disclosure from the most tragic comedies between good, bad, and evil have been very contrstraining on my biofactors against the worst doctrines against the late Dr. Ralph Bunch’s memorial funds. This website gave me more direction in 15 minutes than ten years of off-and-on weekly therapy appointments did. Here I found a list of practical actions to take versus just talking about my problems. Thank you so much. I am so happy I found this site, such a great presentation of CBT. Very informative and reads very well. Useful tips to further aid my own practice as well as self-growth. Excellent article. Very useful information. You put a lot of time and effort into this article. Much appreciated.